Week 12 was a week filled with big time performances, including Saints rookie running back Alvin Kamara making people miss with ease, to the league’s top two wide receivers both producing impressive performances and making incredible catches. With that in mind, here are the Sunday Standouts on offense from this week. 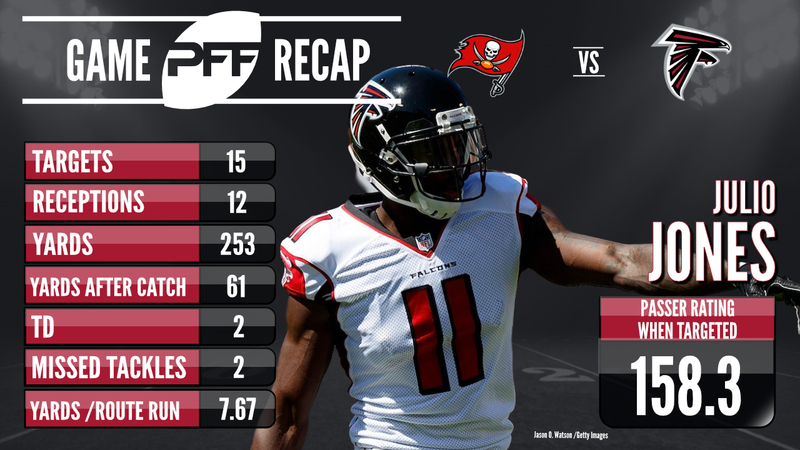 Just in case we were in need of any reminder, Atlanta Falcons wide receiver Julio Jones once again showcased the skills that make him one of the top offensive threats in the game with a huge performance against the Tampa Bay Buccaneers. Jones averaged an incredible 7.67 yards per route run in Sunday’s win, which leads all wide receivers in the NFL so far this week. It was just another day at the office for Pittsburgh Steelers wide receiver Antonio Brown, who caught all 10 catchable passes thrown his way to give him a perfect 0.0 drop rate in the game, along with pulling off an insane catch to go along with it. Brown has now dropped just one of the 81 catchable passes thrown his way in 2017. Another Sunday brought another Cleveland Browns loss, but several performances in the loss to the Cincinnati Bengals should give Browns fans hope more than any other game this year. At center, JC Tretter led all centers with a 90.6 PFF run blocking grade, while he didn’t allow a sack, hit or hurry in pass protection giving him a perfect 100.0 pass blocking efficiency rating. If the final few games of this season are going to serve as an audition for Browns quarterback DeShone Kizer as he tries to prove to the team that he can be their franchise quarterback, more performances like he had on Sunday will be key. Kizer made plenty of plays downfield for the Browns, racking up 133 yards on throws 20 yards downfield or longer, and his deep passing numbers could have been even better if not for a Corey Coleman drop. The Philadelphia Eagles continued to roll towards the playoffs with another big win on Sunday, and once again tight end Zach Ertz was one of the keys to the game on offense. Picking up 103 yards from 38 snaps in route, Ertz averaged 2.71 yards per route run in the win over the Chicago Bears. One of the top performances so far this season, New Orleans Saints rookie Alvin Kamara continued the incredible start to his career with a showing that has to be seen to be believed. 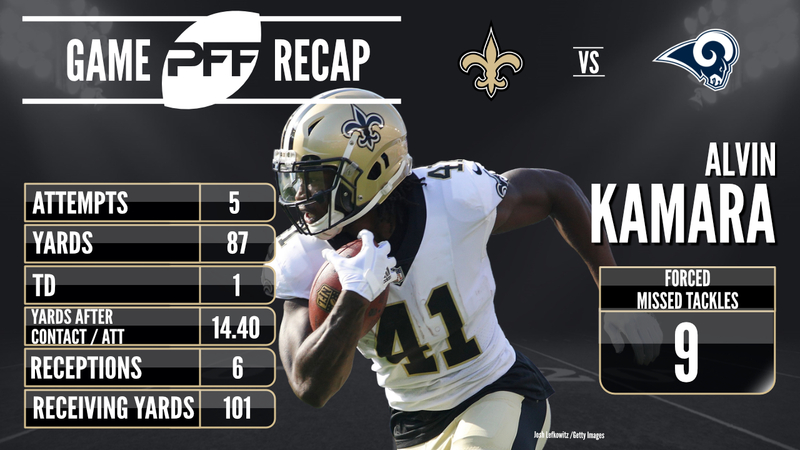 Kamara saw 11 touches on offense, and forced nine missed tackles. Coupled with an average of 13.8 yards after contact per carry, he finished the game with a 1129.1 elusive rating, by far the highest of any running back this week. Oakland Raiders guard Kelechi Osemele once again didn’t allow a single sack, hit or hurry, giving him a perfect 100.0 pass blocking efficiency rating in the win over the Denver Broncos. He was equally as dominant as a run blocker, producing a 92.2 PFF run blocking grade which leads all guards so far this week. Seeing 43 snaps in pass protection, Eagles guard Brandon Brooks, allowed just the single hurry, giving him a 98.3 pass blocking efficiency rating. Like Osemele, Brooks also stood out as a run blocker, with a 89.5 PFF run blocking grade in the win over the Bears. New England Patriots tight end Rob Gronkowski was once again one of the top performers in the NFL on Sunday, averaging 3.15 yards per route run after picking up 82 yards on 26 snaps in route. Gronkowski now ranks second in the NFL with a yards per route run average of 2.11 so far this season. 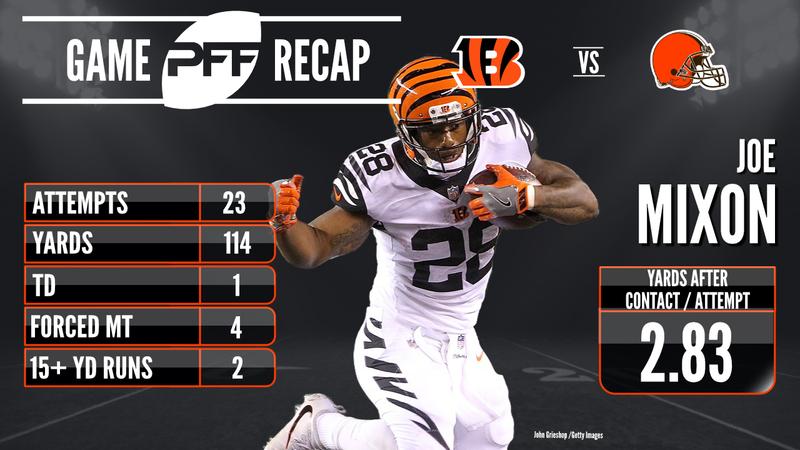 With Cincinnati Bengals running back Joe Mixon seeing the bulk of opportunities in the Bengals backfield, he proved why he is the future at the position for the Bengals with a big showing against the Browns. Mixon averaged 2.83 yards after contact per carry in the win, forcing four missed tackles on 23 carries.